The Rolling Stones have signed an "exclusive, long-term, worldwide" record deal with music giant Universal, the record company has announced. The contract covers future albums by the veteran rockers as well as their extensive back catalogue. Their previous deal with EMI ended in March after 31 years together. 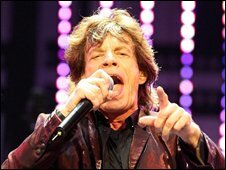 The Stones, fronted by Mick Jagger, had already released a live CD in March - recorded in New York in 2006 - with Universal in a one-album deal. That album accompanied Martin Scorsese's documentary Shine a Light, which featured footage of two shows played in New York in 2006 as well as behind-the-scenes and archive material. New recordings will be released through Universal's Polydor label. Universal said it was also planning "an unprecedented, long-term campaign to reposition the Rolling Stones' entire catalogue for the digital age". The EMI Group, meanwhile, wished the Stones "well in their new venture", adding it looked forward to "a continuing relationship" with the band because it still held their publishing rights. "EMI Music will only ever conclude mutually beneficial agreements with its artists," it added in a statement. The band said in a statement: "Universal are forward thinking, creative and hands-on music people. We really look forward to working with them." The Stones have followed the lead of long-time contemporary Sir Paul McCartney, as well as Radiohead, in leaving EMI. Sir Paul subsequently branded the label "boring", adding its handling of his music was "symbolic of the treadmill". Last year EMI was bought by private equity firm Terra Firma for £3.2bn. This was followed in February by the announcement of the loss of between 1,500 and 2,000 jobs. But EMI has been buoyed in recent weeks by news that the turnover of its music division rose by 61% in the second quarter of 2008. Pre-tax earnings were £59.2m compared with a £45.1m loss in the same period last year. This was helped by the international success of Coldplay album Viva La Vida, which was released last month - towards the end of the quarter. Universal, whose artists include Sir Elton John and the Scissor Sisters, said the Rolling Stones were "seminal musicians who have set the bar for all rock bands in their paths". Chief executive Doug Morris said: "There is no question that the Rolling Stones are one of the most important bands in music history. "Their musical style and off-stage swagger have been emulated by countless others." The Stones, renowned for their extensive tours, were the highest-earning musical act in the world between June 2006 and June 2007. They made $88m (£44m), according to US business publication Forbes. Last week, a spokesman for guitarist Ronnie Wood confirmed the 61-year-old was "seeking help" with his battle with alcohol in a British rehabilitation centre.